Clubhouse for Nirmal Lifestyle Ltd, located at Mulund, Mumbai covers an area of more than 20,000 SFT. Facilities include a gymnasium, play area with indoor games, running track with rubber flooring and a badminton court. 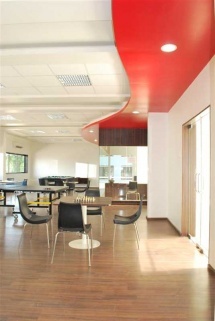 This entry was posted in Commercial Interior and tagged clubhouse, clubhouse at mulund mumbai, gymnasium interior, interior design. Bookmark the permalink.